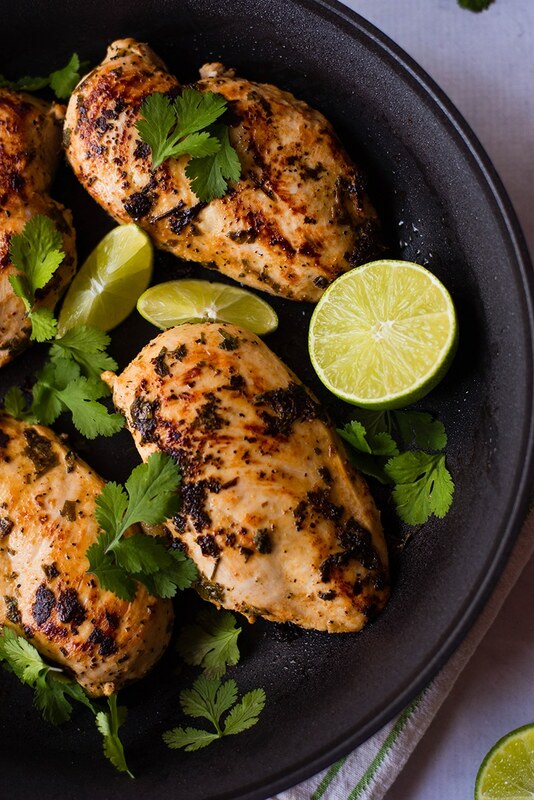 This easy Cilantro Lime Chicken recipe is quick to make and has tons of flavor. Perfect chicken marinade for grilling, baking, or sautéing and freezes well, too. Okay, peeps. 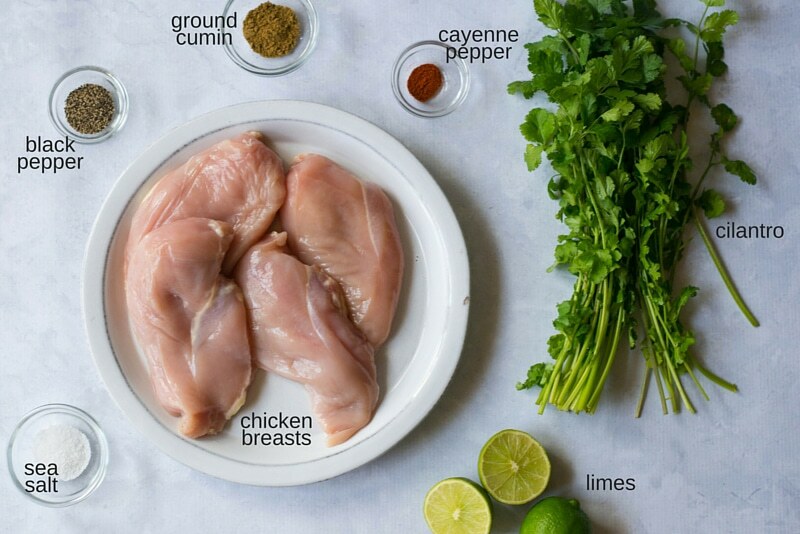 It’s time we talk about this cilantro lime chicken recipe right here. Now, I’m gonna go out on a limb and assume you’re into the whole flavorful, healthy, easy, and filling thing with your dinners. <— Nice! And, well, chicken, for that matter. Assuming all those assumptions are correct, I’d like you to prepare your tastebuds for shockingly easy deliciousness. 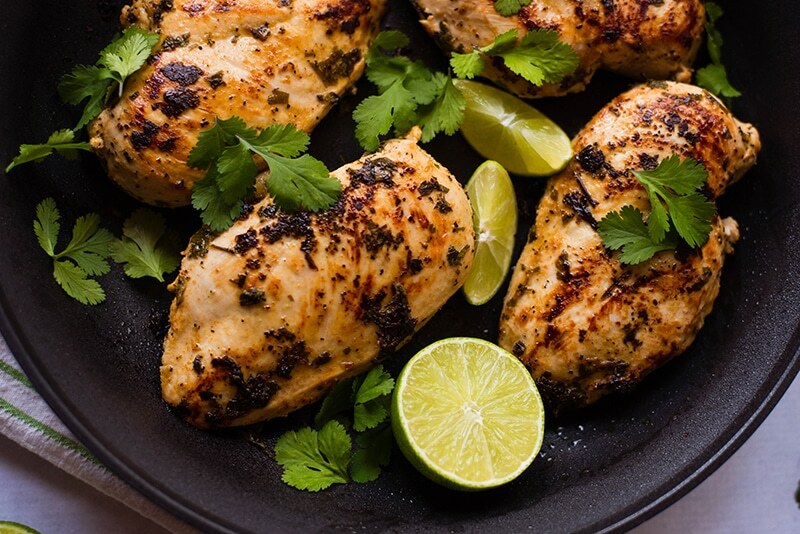 This Cilantro Lime Chicken recipe is my absolute favorite chicken marinade recipe. And I have a ton of them. 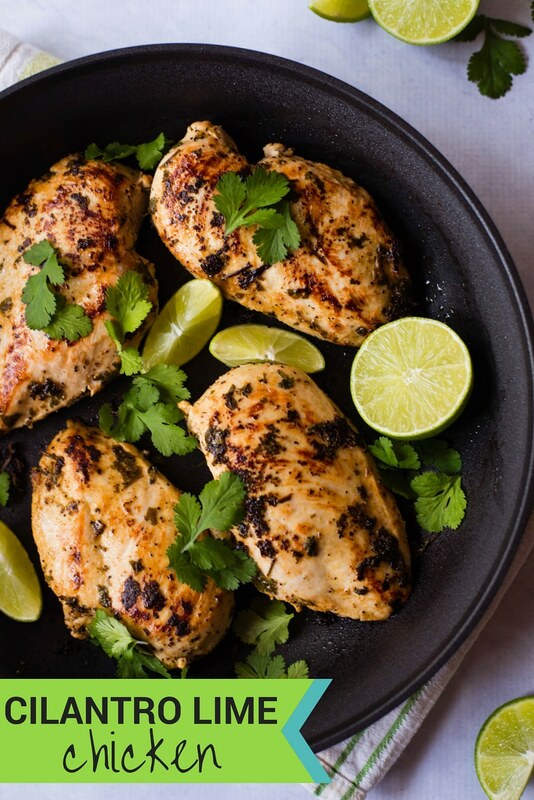 Not only does this easy cilantro lime chicken marinade result in tender, juicy chicken every time, it’s also so simple to make. It comes together very easily and freezes well, too. I like to prepare the marinade in a 1 quart freezer bag and add the chicken to marinate. That way, if I don’t get to cooking it in time, I can toss it in the freezer and defrost at a later date. I’ve baked, grilled, and sauteed with this marinade and all work perfectly. It’s a no-fail recipe, for sure. During the week, Dustin and I like to meal prep our meals for the next several days so we have easy-to-grab lunches and dinners that make it as painless as possible to eat healthy. Because, when you have easy-to-grab, healthy and delicious food in your fridge, you EAT it. And it just so happens that, in addition to be super yummy right when you make it, this cilantro lime chicken recipe also reheats very well. A quick tip: If you are gonna meal prep, try dicing the chicken into bite-sized cubes and storing in these handy containers. This makes it SO MUCH easier to reheat the chicken, which — in turn — makes it stay as juicy as possible. Because we want to keep in all that cilantro lime juiciness. And dry chicken breast is no fun at all. The more marinades you use during the week to keep up the variety, the less you’ll get tired of your meals, too. Check out these tasty chicken marinades for more easy ways to marinate and meal prep your chicken. What Goes With Cilantro Lime Chicken? In summary, eat this cilantro lime chicken. It’s magical. 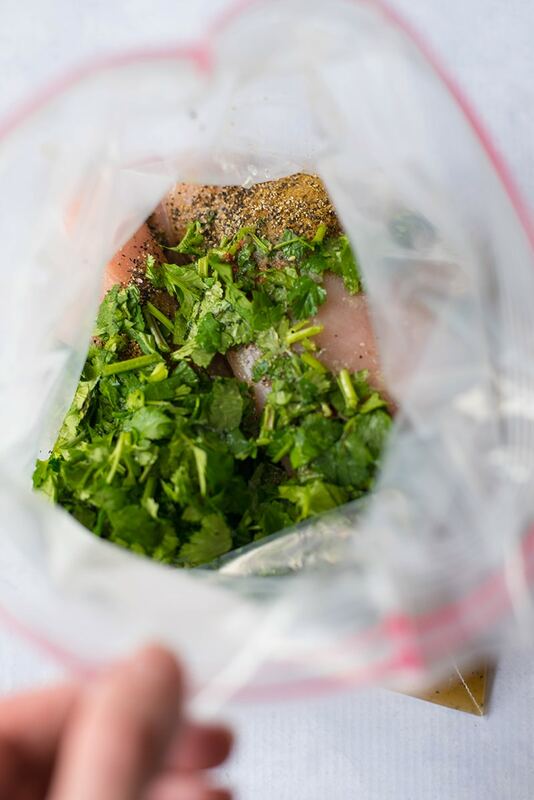 In a large mixing bowl or large sealable, Ziplock bag, combine the chicken breasts, freshly squeezed lime juice, ground cumin, sea salt, ground black pepper, cayenne, and fresh cilantro. Toss to combine and coat the chicken well. Cover with plastic wrap (or close Ziplock bag tightly) and place in the fridge for at least 30 minutes, preferably 2-3 hours, to allow the marinade to work. Heat a skillet over medium-high heat with the olive oil. Remove the chicken from the fridge and place in the hot oil. Cook the chicken until well-browned on both sides and cooked through, about 4-6 minutes per side, or until the chicken reaches 165 degrees F internal temperature. Allow to rest for 5 minute before slicing and serving. If you happen to not care for cilantro, you could easily replace with italian parsley. Great recipe – the flavor was great and we thought it would be fantastic a cauliflower tortilla taco I wonder is there a conversion to this recipe for a slow cooker? so we can get the great flavor and the shredded chicken?? To answer your question, I did this in the crock pot tonight and it was awesome!! I added a couple cloves of garlic. Other than that didn’t change the recipe just dumped it all in the crock pot. Not sure 4-6 minutes preside is enough time to cook the chicken throughly ! How long do you bake it for? Temperature? Can it be baked ??.. The calories seem a bit high for just some seasoned chicken breasts. By my calculation, it would only be 200 calories per serving. What’s driving it up? The problem is the “4 chicken breasts”. We don’t know how much they weigh. What I did is just put 1lb of chicken and reduced the seasonings by half to enter into MFP. It comes out 186 calories per serving – there are 3 servings for 1lb of chicken. Hope that helps! Great recipe, thanks for sharing! Have made this multiple times now, and is one of my ‘go to’ recipes for easy and healthy week night meals. Its very simple, yet extremely flavourful and satisfying. I usually pair with Mexican Rice and Mexican cumcumber salad. Hubby loves it too. I have tried this recipe, but I had used paneer and vegetables and marinades paste to make BBQ. I must say, use of marinades paste for BBQ makes most yummiest dish. I liked the combination of lime and cilantro. But this one came a little bit too salty and strong for me. Maybe because I did pour the rest of the marinade while I cooked it. Will do this again and will try to use less measurements. 53 g of protein? Really? Gonna try this tonight! Hi, I really love your posts/recipes; however, I’m a little confused about the 1g/serving listed in a couple of the nutritional analyses (cream of broccoli soup/cilantro lime chicken). Are those amounts correct? I am type 1 diabetic, so carbohydrate amounts/serving are important for knowing how much insulin I need. Thanks in advance for your reply. Superb recipe. I love chicken and eggs dishes. As professional women, i did not get time to cook at home. Most of the time I had my food at out. I thought this will be easy to do and delicious to taste. Thank you Lacey. Keep sharing. 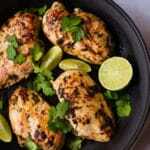 awesome post, I like your post because you talked about the how to make the cilantro Lime chicken and you provide the full recipe of the cilantro lime chicken so your post is really useful and helpful. please keep sharing the post. thanks for sharing the post. Yea, this is perfect for meal prep and sounds so good! We made this for dinner tonight and it was amazing. I love your recipes! Yay, so glad you enjoyed it! Thanks so much!! I’m getting ready to try this and don’t have enough fresh lime on hand. Would combining lemon and lime work, or maybe a bit of olive oil?